Professional version of the Codelobster PHP IDE has in its structure an excellent tool – the unit for working with the CMS Joomla. 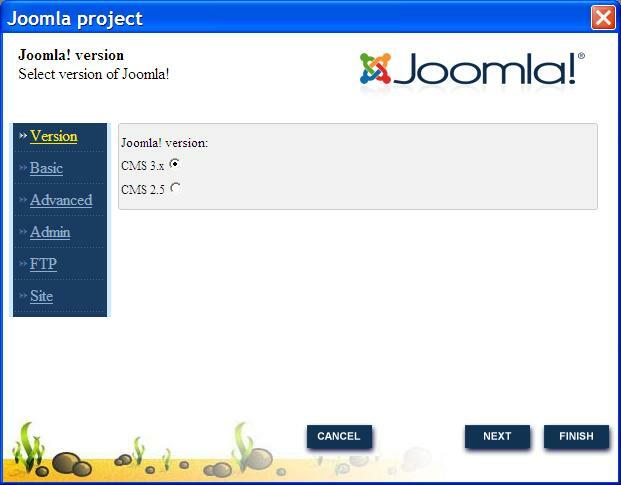 Of course, we can edit PHP or HTML files by using any editor tool, but built-in unit of Joomla can extend the features of the program and transforms Codelobster into a fully functional Joomla IDE. Installation of content management system, for example, on a locally running servers. Creating and configuration the project in your IDE. And only then, when a new empty version of CMS is installed, you can create themes for your site or develop a module. Codelobster PHP IDE allows to combine all the stages of the project deployment and to make preparations for the work directly in the IDE. Run local HTTP Apache server and MySQL data base, for that I usually use the XAMPP package – very convenient set of programs for web-developers. Everything is ok, then you can work Codelobster and nothing to worry about, we even will not have to download CMS – program will take care about everything. So, run the IDE go to the main menu, and then move by the next sequence of items: “File” -> “New” -> “Project” to run a new project wizard. 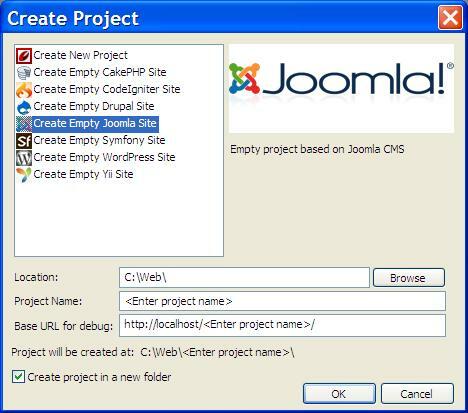 Using the dialog box, which has appeared after previous step, specify the type of project, “Create an empty Joomla site”. 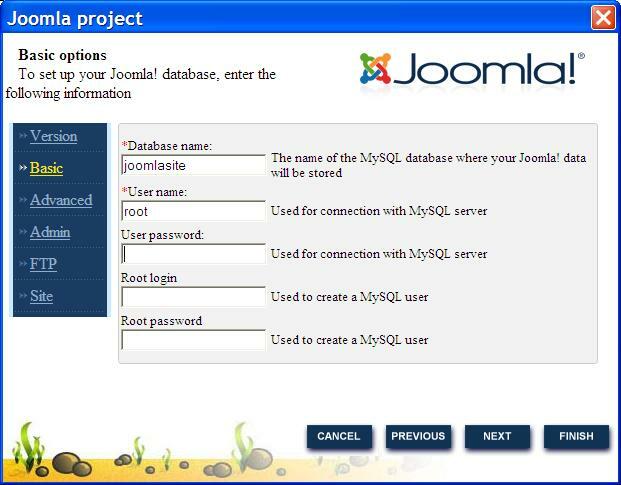 First of all, we write the project name “joomla-site” and choose the path to it. The project is located in the folder “htdocs” on the local server. Note the item “Create a new project in the folder”. What was the result? Let’s examine the dialog box carefully. The path to the project “D:\xampp-portable\htdocs\” – in this directory on the local server will be created a folder to place all the source files of the project. The last line – URL of our new website “http://localhost/joomla-site/”, we will use it for testing and debugging. Then click “Ok”. Next we will configure the new Joomla project. 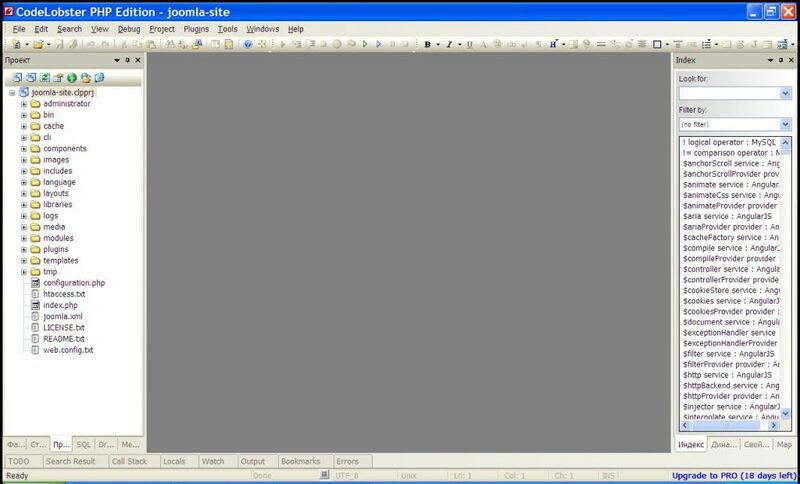 Then the first dialog window of IDE immediately invites us to choose Joomla version. Make your choice and click “Next”. In the next step the connection parameters to the database must be entered. We enter the name of the database, what the IDE automatically creates for us, and also enter the user name and password to connect to MySQL. Go to the next dialog. In this case, the advanced settings is no need to change, as the database is also running locally. Follow further. Wizard prompts you for administrator account data of the new site. Specify the user name, password, email address and press “Next”. The next dialog lets us to configure FTP access. In this case, is not necessary to configure it, since we work with server on a desktop and have full access to the source files. Skip this step and go on. At the final stage we will think up the name of our website and will enter it in the first string. Leave the other settings as default. 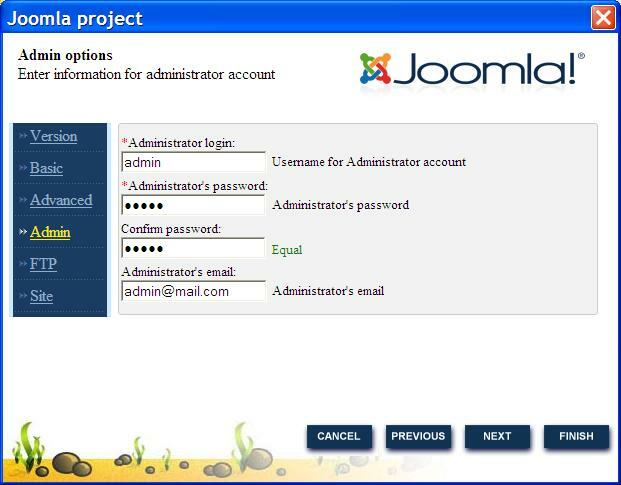 Next, the wizard downloads the latest version of Joomla from the official site, makes installation and configuring of the project and opens it in a programming environment. 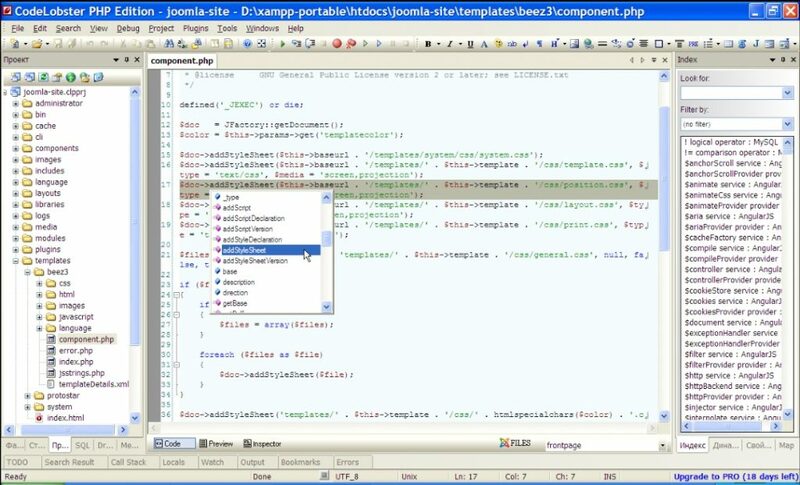 To begin editing the project, go to the folder “templates”, open the folder “beez3” -> “components.php”. For quick tips on functions, you just should hover over the item of interest. To use the code completion, you should move the cursor to the desired position and press Ctrl + Space. Thus, we have quick access to all variables and functions of Joomla, it will speed up and make more comfortable the process of development. 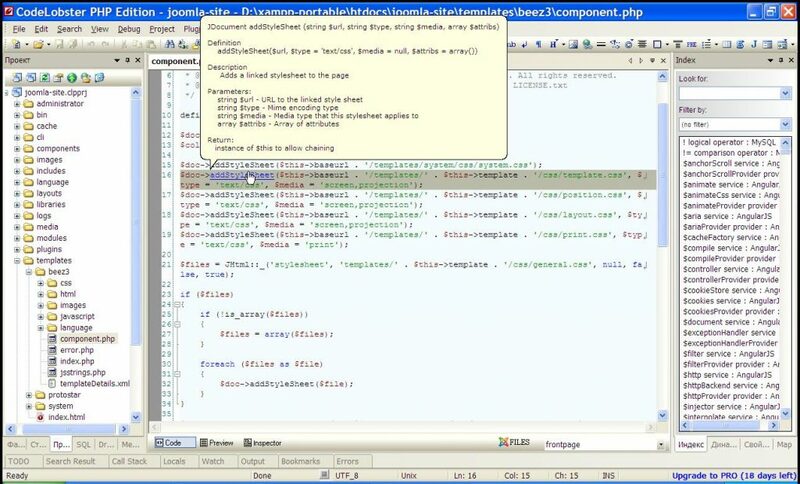 Right in the progress, without distraction, and without leaving the program, you can use the contextual and dynamic help, if you need to clarify the Joomla API syntax. 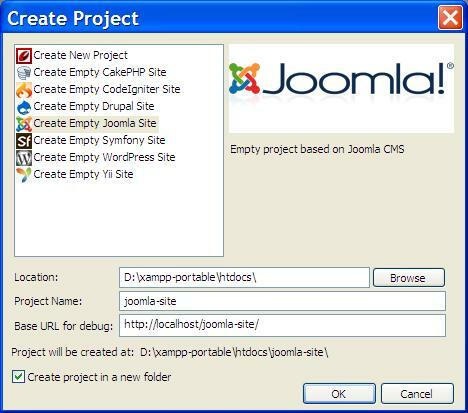 So, let’s boldly proceed to the realization of our ideas, Codelobster PHP IDE provides wide opportunities for creating professional sites on Joomla. Codelobster PHP IDE also has modules for other popular frameworks and content management systems: Drupal, WordPress, Smarty, Twig, JQuery, CodeIgniter, CakePHP, Laravel, Symfony, Yii, Laravel, AngularJS.